The Windows Remote Desktop is a built-in tool that lets you take control of a computer over a network connection. It is useful for accessing computers that are not sitting in front of you, and it’s something that I use quite frequently. I’m typically connecting to several computers every day using Remote Desktop, and it finally dawned on me that there had to be a better way to do it than pulling up the application every time. I came across a site from Microsoft that details special parameters you can use when creating a Remote Desktop shortcut, and it’s incredibly useful. 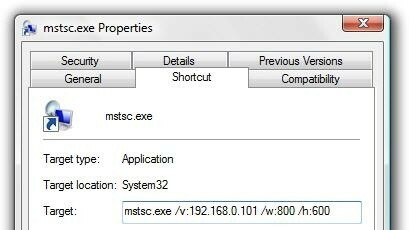 mstsc.exe – this is the name of the Remote Desktop application, and is required for the shortcut to work properly. 192.168.0.101 – this is the name or IP address of the computer you want to connect to. 800 – this is the resolution width for the computer that you’re connecting to. 600 – this is the resolution height for the computer that you’re connecting to. With this information you’re able to create shortcuts for all of the computers you connect to, and when you execute the shortcut it will immediately begin connecting to the computer specified. This can definitely shave precious seconds off of the time it takes to launch Remote Desktop!